The Sakya tradition is known as the ‘holder of all the Buddha’s teachings’ due to the vast extent of teachings and practices it has preserved in its long history. It takes its name from the monastery founded at Sakya in south-western Tibet in 1073 by Könchok Gyalpo of the Khön clan. Since his time the leadership of the tradition has remained within the same family. 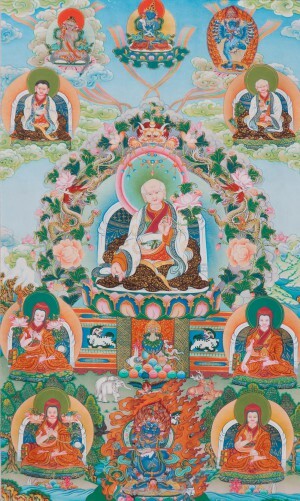 Könchok Gyalpo was followed by his son, Sachen Kunga Nyingpo, the first of the five ‘gongmas’ (venerable masters), who in turn was succeeded by Sonam Tsemo, Drakpa Gyaltsen, Sakya Pandita and Chogyal Phakpa, teacher of Kublai Khan. These five founding lamas gave the tradition its distinctive shape. Sakya Pandita was particularly renowned throughout Tibet and beyond for the depth of his knowledge and mastery of all the teachings. He was also instrumental in preserving the efficacy of the dharma by clarifying the misunderstandings which arose during the early history of Buddhism in Tibet. The current Sakya Trizin is directly descended from these ‘gongmas’. The most important of the tantric transmissions that the school has preserved is the Hevajra Tantra with its associated instructions known as the Path and its Fruit, which had been developed by the 9th century Indian yogin, Virupa. Other key transmissions include the cycles of Vajrayogini, Vajrakilaya, Mahakala and Guhyasamaja. Over the centuries numerous men and women have achieved great realisation through the study and practice of the teachings preserved within the tradition. His Holiness Kyabgon Gongma Trichen, the formerly the Sakya Trizin, was born in Tibet in 1945 and is the forty-first to hold that office. 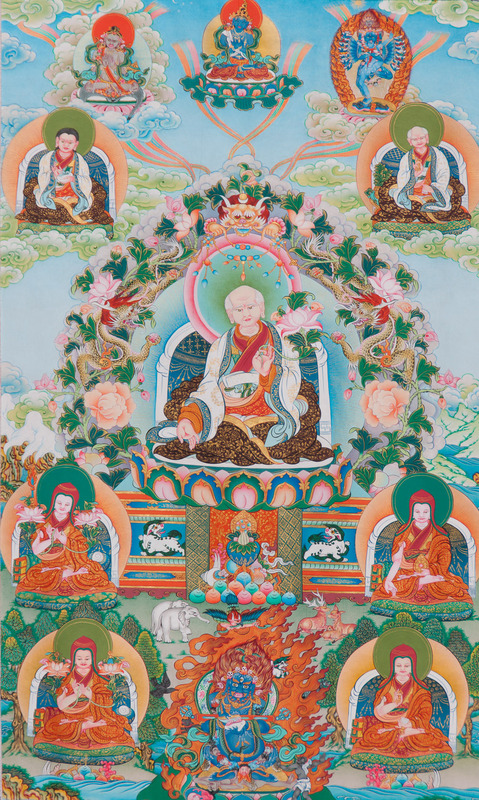 From his teachers, who included many great masters, His Holiness has inherited all the teachings that have been preserved within the Sakya tradition. In 1959 His Holiness was forced to leave Tibet after it was invaded by Communist China. He now lives in India and has worked tirelessly to establish the school worldwide. 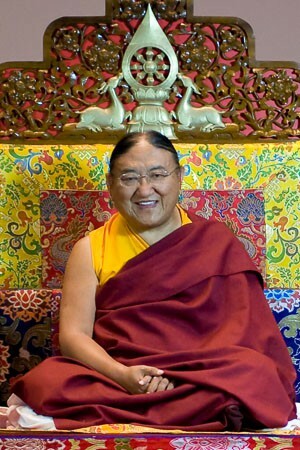 His Holiness is married and has two sons, Ratna Vajra Rinpoche (b. 1974) and Gyana Vajra Rinpoche (b. 1979) and several grandchildren. For more information, please visit www.hhthesakyatrizin.org/tradition. 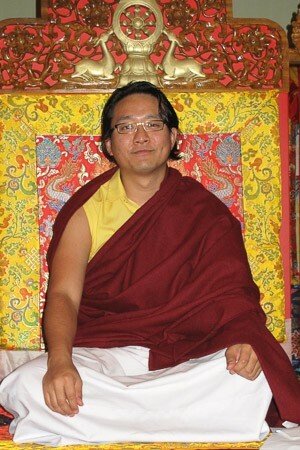 His Holiness Kyabgon Gongma Trizen Rinpoche, the 42nd Sakya Trizin was born in 1974 and is the eldest son of His Holiness Kyabgon Gongma Trichen Rinpoche (the 41st Sakya Trizin). Sakya Trizin means ‘holder of the Sakya throne’ is always drawn from the line of the Khon family. He was born in 1974 in Dehradun, India. During his childhood he studied under the tutelage of the Venerable Rinchen Sangpo. At the age of six, he received the precious Lam Dre teachings of the Sakya tradition for the first time. In 1990 he entered Sakya College and studied Buddhist philosophy for many years. 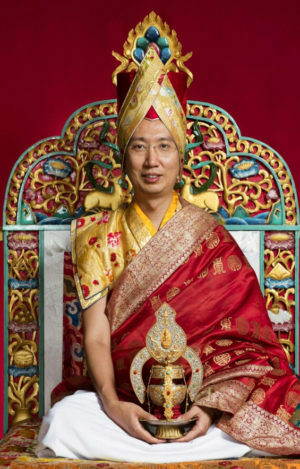 His many eminent teachers, from whom he has received numerous philosophical and vajrayana teachings, include His Holiness the 41st Sakya Trizin, as well as Chogay Trichen Rinpoche, Luding Khenchen Rinpoche and Dezhung Rinpoche. Gyana Vajra Rinpoche is His Holiness’s younger son. Like his brother, Rinpoche has received numerous teachings and has been invited to teach at many centres around the world. He speaks fluent English and is also married and a father. The lamdre (“Path and Fruit”) is the central teaching of the Sakyas. It derives from the Hevajra tantra and was formulated in India in the ninth century by the tantric yogin Birwapa. Having achieved insight into Hevajra, he set out the stages to buddhahood in the Triple Vision and the Triple Tantra. 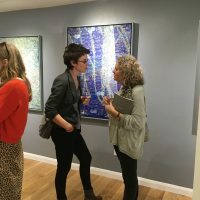 The Vision of Experience – achieved through the generation of conventional and ultimate bodhicitta, which derive from the practice of samatha and vipasyana. The Vision of Purity – achieved when we hear the qualities of enlightenment and aspiration arises to attain it through subsequent practice. Base or Ground Tantra – developing the sense of the inseparability of samsara and nirvana, seeing both as projections of mind. Once confidence in this view develops, one proceeds to the next stage. Path Tantra – containing the development and completion stages and deriving from the four levels of initiation. Fruit Tantra – setting out the achievement of the five bodies of buddhahood. Hence through the practice of lamdre, buddhahood is certain. The Sakya tradition is the richest in possession of teachings, as reflected by the common reference to them as “the owners of all Dharmas”.